The stunning tropical plants known as the Bird of Paradise all stop people dead in their tracks when displayed in a shop window. If you’ve seen one of these distinctive flowers and want to know more, read up on both the symbolic and botanical facts about this eye-catching flower. – Optimism towards the future. 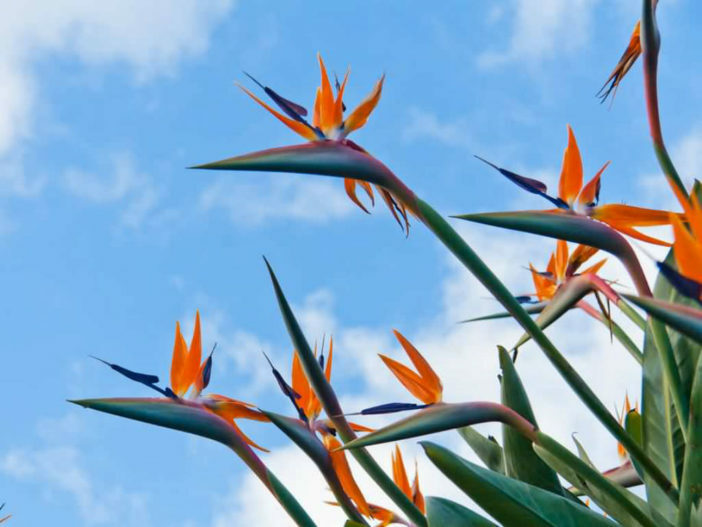 All 5 different Bird of Paradise flowers get grouped together in the genus Strelitzia. While the common name comes from the bird-like appearance of the bloom, the scientific name is drawn from Queen Charlotte of Mecklenburg-Strelitz. She was married to King George III when the flower was first imported into Great Britain, so the royal gardener named it after her. It’s also more commonly called the Crane Flower in its native home. Since all the Bird of Paradise species feature different sets of 2 contrasting colors, the contrast has more meaning than the specific colors. The look created by combining bright orange and purple or gold and dark blue petals truly makes the flower look alive and like a bird about to take off from the plant’s stem. All five species sport bright colors rather than muted or pale tones, adding passion and energy to the symbolism behind them. While they respond well to being kept in a greenhouse or other humid and warm environment, there is still relatively little breeding of Bird of Paradise plants to produce new varieties. All 5 species currently available developed in the wild on their own. These plants usually rely on nectar-feeding sunbirds for pollination, so professionals and hobbyists that want to breed their own flowers must do the delicate work themselves with special tools. A few plants that share the same name with the Bird of Paradise are used for medicinal purposes, but the true version is poisonous and offers no medicinal or edible value. The unscented plant also produces no oils or absolutes for perfume formulation.